OK, I lied. It’s week 9, but I didn’t know that when I wrote the title. Then I decided that I should stop being lazy and figure it out, so there you go, week 9. The schedule for week 9 called for five miles on Tuesday, four on Thursday and eleven on Saturday. I was able to do the five (9:57 pace) on Tuesday and that’s it. My right lower leg is giving me some serious trouble. I’ve got pain in the back, from the heel to the calf and then on the inside, right in the soleus region. I’ve been stretching, icing, ibuprofening, rolling, massaging, strengthening, trigger pointing, taping, compression sleeving and just about anything else that I read about on the Source of All Self-Diagnosis (aka the internet), but I’m not having much luck. I went back to my PT guy on Thursday for some myofascial release and he found that my right hip was a bit tipped forward (toward the ground) resulting in my right leg being a tad longer than my left. He surmised that because of this, my right leg was taking a considerable beating when I was running and that was probably causing the majority of my troubles. He worked for quite a while on my hip, quads and calves and everything felt pretty loose and happy when I left. He did warn me that I might feel sore the next day, and I didn’t really believe him (myofascial release therapy isn’t exactly like deep tissue massage or any massage, for that matter), but the next day I certainly was sore. Doh. I have a bunch of stretches to add to my exiting 40 minute stretch routine and a re-evaluation next Wednesday. Hopefully my hip will stay where it’s supposed to be and everything else will settle back down. Anyway, it was kind of a bad training week for me. I ran on Tuesday, skipped my XT on Wednesday, then skipped my run/XT on Thursday for PT and dinner with friends. 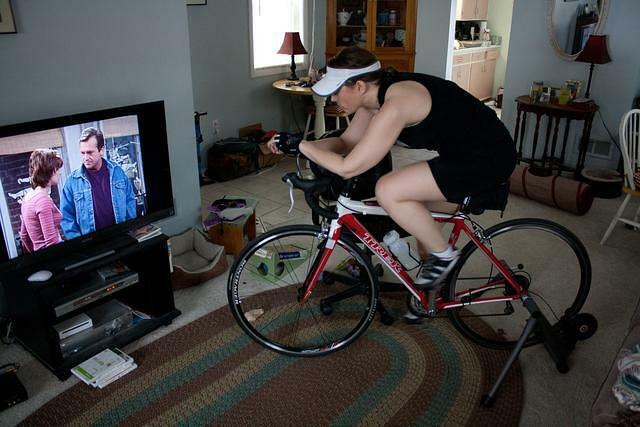 I was really itching to go running on Saturday, but common sense prevailed and I decided to ride the trainer instead. An ninety minutes and four episodes of “Roseanne” later (episodes are around 23 minutes, no commercials on Netflix! ), I’d ridden 35 miles. Here’s me pretending to look all serious trainer ridery while watching Nancy (Sandra Bernhardt) tell Arnie (Tom Arnold) that she likes the ladies. Please excuse my messy house and no, I don’t have aerobars, think I should get some? I think I’d probably kill myself if I tried to use them on the road, but I think I decided they’re a must for long trainer rides. We spent the rest of the weekend finally getting paint on the walls of the spare bedroom that was gutted & dry walled this fall. I’m turning it into a workout room so I chose a cheery yellow color because I thought it would put me in a good mood when I was sweating away. Trouble is, it was like three months ago when I selected the color and I must have been in a really good mood because it’s not just yellow, it’s YELLOW. I sincerely hope it grows on me. Finally, we watched “The King’s Speech” on Amazon on Demand last night. After all the hype and critical acclaim this movie got, I was expecting it to be really good. I thought the story was interesting, especially so because it was true, and the acting was really good, but it just didn’t hold my interest and I found it to be quite the snooze. Sorry movie fans, this one gets a thumbs down from me. Next week, I’m supposed to do 3, 4, and 12 mile runs. I’ll attempt the 3 miler and see how it goes from there.